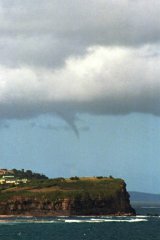 Supercellular tornado off Jervis Bay, NSW during the Sydney to Hobart yacht race 26th December 2001. The first video captures are taken by the crew of yacht "Nicorette". A sequence of 33 spectacular video captures is available here. 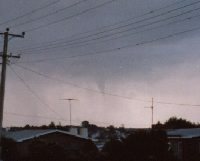 A small funnel from large cumulus at McLeans Ridges (Northern Rivers, NSW) on 16th June 2000. Photos by Michael Bath. Report here . Although this last photo indicates something like a wall cloud area and inflow band, it was in between this and the precipitation core where the funnel and dust whirls occurred a few minutes after this photo. 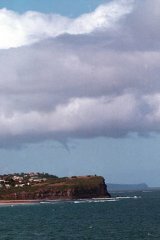 This supercellular funnel occured at Shellharbour, south of Wollongong, NSW just after 6pm on 23rd March 1997. Chase Report by Michael Thompson. 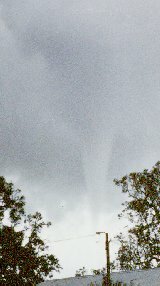 This tornado occurred at Bearbung, near Gilgandra, NSW on the 29th September 1996. Photographs taken by Chris Cooke. Click here for the full chase report. 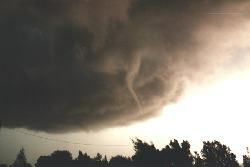 Another tornado was photographed on the same date. 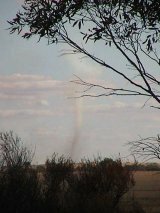 These photos were taken by Neal Davison at Bundella, NSW. Click here for the full chase report and additional pictures. "It was Melbourne Cup Day about 5:30 in the afternoon. I was alerted to the storm by my young son who was playing outside and was scared and excited by the rapid churning/boiling effect of the clouds near where I took the photos. By the time I got outside I was amazed as I had never seen anything like it before so I went back inside to grab the camera. When I came back out I was lucky enough to capture the start and end of the twister. The whole event only lasted for about 5 minutes. At the point of contact, fully grown gum trees were uprooted like twigs and a ringlock fence with steel posts was flattened on the ground. The photos were taken on slide film with a 28-80 and 100-300 lens. Very few people in town actually saw the event and when I showed the slides at a Disaster Planning night, the only reason the people in attendance believed the pictures were taken at Merriwa was the Merriwa silos in the foreground. The really scary part was what would have been the impact if it had touched down in town about 4 kilometres away." 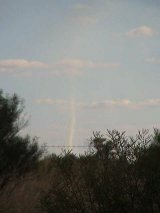 This tornado was observed by Wayne McCallum of Booleroo, SA and occurred early November 1992. It was accompanied by large hail and flash flooding and tracked SE causing considerable damage to property in the area. Photo and report by Andrew Boskell from Devonport, TAS. 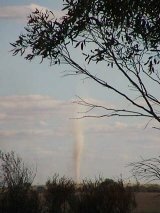 There is an interesting story attached to this landspout photo. On the 8th February, 1989 there was a huge thunderstorm. I have never seen a storm like it since. It started over the sea around 20:30, then moved inland and lasted until around 00:30. I didn't know it at the time, but I'm sure it was a supercell. 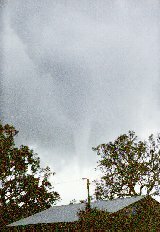 The next day, 9th Feb., I was having a hit of cricket with the guys when I spotted the funnel cloud. So I grabbed my camera and took the photo. There was nothing special about the weather that day, the clouds were only ragged towering cumulus. There was a gusty north-westerly blowing, which was quite cold for summer.